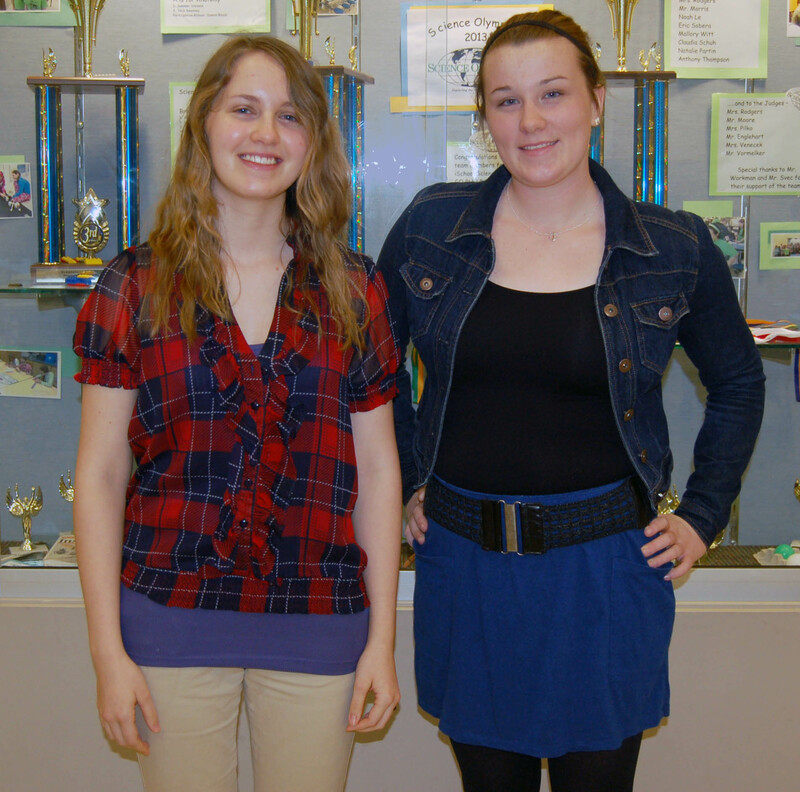 Madeline Matia is a National Merit Semi-Finalist with classmate Molly Mills named a National Merit Commended student. Madeline has the opportunity to continue to compete for 8,000 National Merit Scholarships worth about $35 mllions that will be awarded in the spring. Although Commended Students do not continue in the competition for National Merit® Scholarships, some of these students do become candidates for Special Scholarships that corporations and businesses sponsor. Madeline, who has a 4.16 GPA and ranked seventh in her class, has participated in Masquers, GSA, Key Club, chorale and Cross Country. 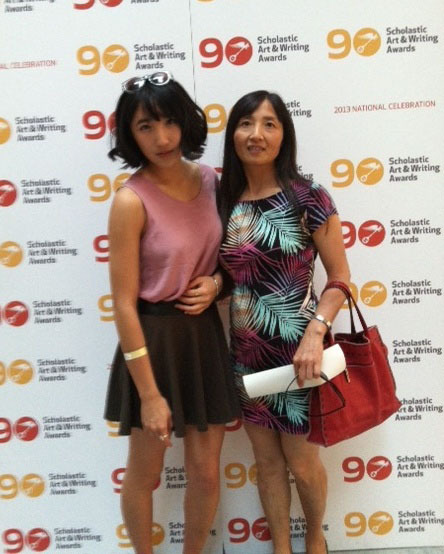 She also was involved in the Natural History Museum’s Future Scientists program. She volunteers with Cleveland’s nonprofit UCREW, which helps local food banks and churches in the area. She also organized a concert with it that raised money for domestic violence and child abuse awareness and prevention. She plans to study conservation biology in college, hoping to work in a nonprofit such as Defenders of Wildlife and minor in French. Her parents are Steve Matia and Megan and Patrick McClain. Molly has a 4.297 GPA and currently ranks third in her class. She is a four-year swim team and choir member, president of Rho Kappa Social Studies Honor Society, NHS, Mu Alpha Theta, a math honor society and French Honor Society. She has studied cello and piano privately. She lifeguards and is a manager at a pool in the summer. She will attend either Xavier, OSU or Grove City College to major in biology. She plans to pursue a career in medical research after her undergraduate studies and work toward a PhD, with an interest in brain research/neuroscience. Her parents are Dave and Pam Mills. Congratulations to these fine students. Local safety forces joined school administrators to address students at Olmsted Falls Middle School during their lunch periods yesterday. Officials conveyed to students the seriousness of making a bomb threat, following Tuesday’s evacuation of Olmsted Falls Middle School as a result of a note found in a girls’ restroom at the end of the school day. All students were evacuated on Tuesday afternoon and held at the soccer fields, where they were picked up and transported home on their regular school bus routes. This was the second bomb threat hoax at Olmsted Falls Middle School within a week. 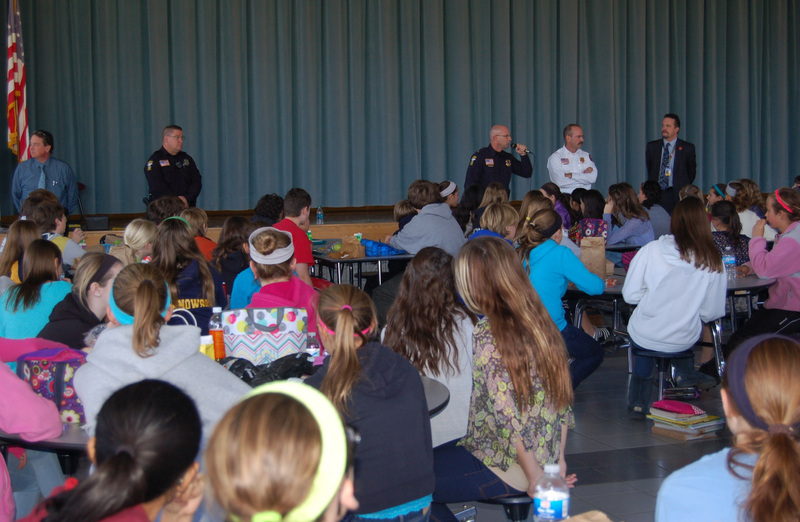 Olmsted Township Police Chief John Minek and Olmsted Township Fire Chief John Rice spoke with students about the ramifications of making false threats and the impact that such threats have on their school and community. There will be no school for students on Tuesday, November 5th — Election Day. The Olmsted Falls School District will be holding the first of three Staff In-Service days scheduled for this school year on Tuesday, November 5th. The two remaining Staff In-Service (Non-Students) days are scheduled for: Friday, January 24, 2014 and Friday, February 14, 2014. 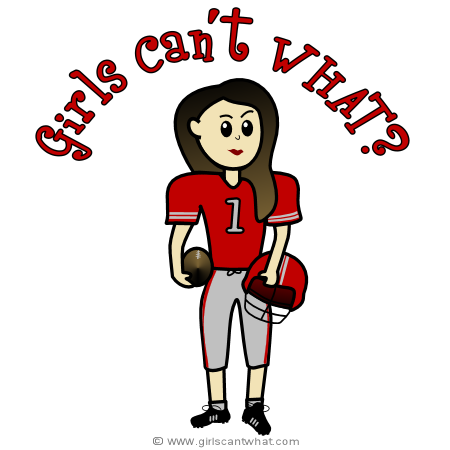 The annual Powder Puff Football game is Tuesday, November 5, at Charles Harding Stadium. Gates open 6:30 p.m. for the 7 p.m. competition. Admission is $5. The presale cost is $4 for students during the lunch periods at the high and middle schools. Festivities at the game include half-time games, raffles and concessions. All proceeds benefit OFHS Post Prom Committee. The mini cheerleaders are invited to support the girls. They will receive FREE admission if they wear their mini T-shirts. Moms of the mini cheerleaders also are welcome. VOTE THIS TUESDAY, NOVEMBER 5TH!! ATTENTION BULLDOG PARENTS! DON’T FORGET TO VOTE THIS TUESDAY, NOVEMBER 5TH. Olmsted Falls High School needs your support. ISSUE 86 is a 1.8 Mill Bond on the November 5, 2013 election ballot. With your support, this Bond Issue will pay for the construction of classrooms, renovation of common spaces, and upgrades to security systems at Olmsted Falls High School (OFHS) needed to address overcrowding and improve safety/security for students and staff. • OFHS is OVERCROWDED. Built for 815 students in 1967, 2016 will welcome 1,300 students. • The decade old trailers bought to alleviate overcrowding cannot keep pace with growth, or reduce overcrowding of common areas. • Survey of our registered voters prioritized concerns about school safety and security issues. The majority surveyed asked the school to make needed changes. • Due to increased enrollment, OFHS requires nearly 1,000 students to pass between the main building and the trailers each school day. This is a safety and security issue. • The crowded common spaces compromise emergency exit routes. This is a safety issue. • Independent analysis by the PLE Group raised these safety issues, as well as the lack of OFHS security systems. • Construction costs and building loan rates favor acting now. • The $15 million generated will pay for construction of additional classrooms, renovation of common spaces, and upgrades to security systems (including security cameras). • OVERCROWDING in OFHS is at a tipping point for student/staff safety and security. Issue 86 is a response to protect our students and staff. ECC, Falls-Lenox & OFIS parents are invited to submit photos from today’s Halloween parades and festivities to be included in the building photo galleries to be featured in next week’s blog post. Please email photos to kpetrina@ofcs.net. Each year the Berea Rotary donates a brand new dictionary for each third grader. The Olmsted Falls school district includes a portion of Berea. 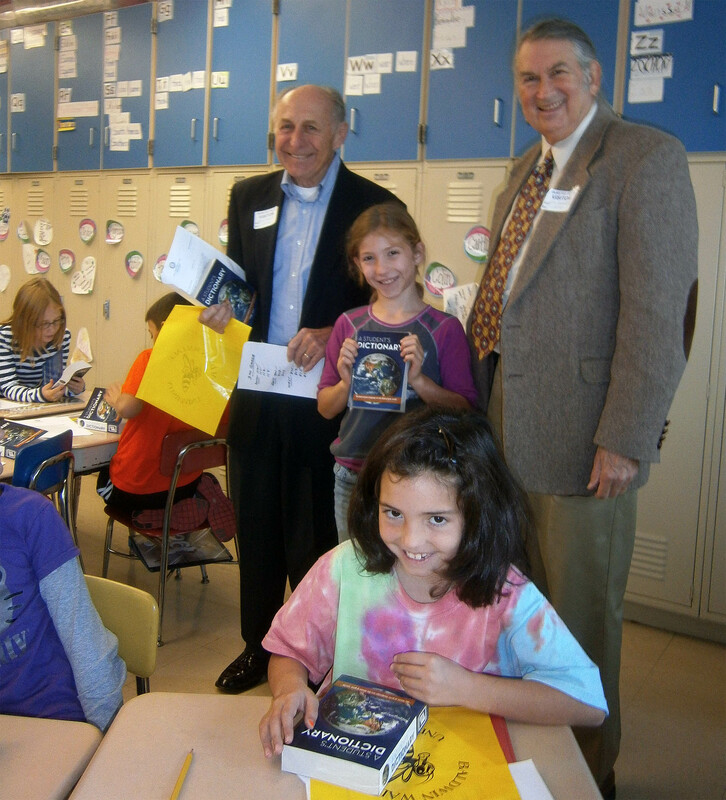 Jack Kafer, left, and Jim Walters spent a morning last week delivering the dictionaries to all third grade classes. The students and teachers are very grateful to have this tool for their use in the classroom and at home. A big Bulldog thanks to Berea Rotary for its thoughtfulness and generosity. To look at a photo gallery of the event, click HERE. The Bulldog Buddy program returned this year with a slightly different format. The program previously was a collaborative effort between Olmsted Falls High School and Falls-Lenox Primary School. The group has reached out to residents of the Renaissance retirement community due to high school students’ unavailability this year. Renaissance residents have been very excited to become our new Big Bulldog Buddies and mentor Falls-Lenox students. They began mid-October and will be in Falls-Lenox each Wednesday. They spend 30 minutes with their Little Bulldog Buddy in reading, playing games and/or helping with classwork. 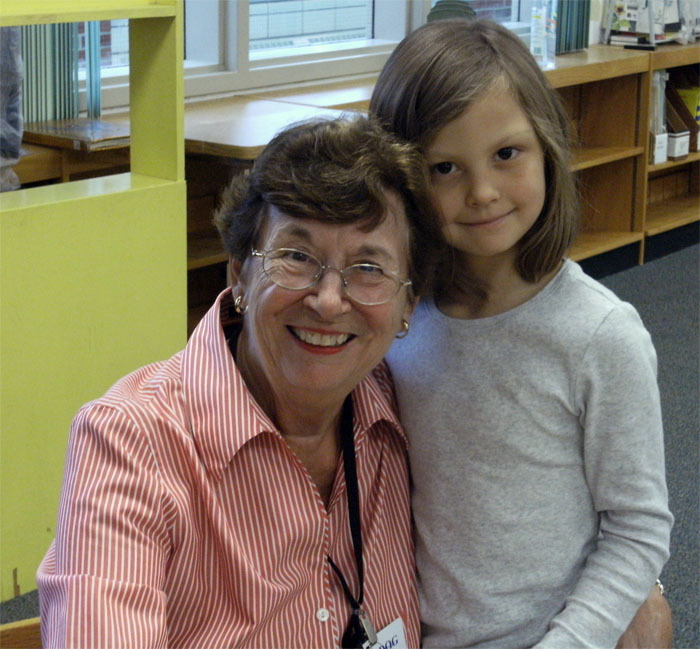 For a photo gallery of seniors helping students, click HERE. The program continues to reach out and seek more mentors so more students may benefit from this program. If you are interested in being involved and becoming a Bulldog Buddy, please contact Angie Butto, Falls-Lenox counselor, at 440-427-6407 or abutto@ofcs.net. The purpose of the school health clinics is to provide care for the health, wellness, illness and injuries of all students. The clinics administer daily prescribed medications for students (as needed), provide first aid, assist with school emergencies, and follow health care plans for chronic conditions. The clinic staff is responsible for school health records, recording immunizations, and health screenings. Each health clinic is staffed with a health aid, or a medical assistant, supervised by the one RN for the District. Please understand that the school clinics are not set up as doctors’ offices, so the staff is unable to check ears, identify rashes, fix broken bones, diagnose specific illnesses or prescribe antibiotics. Please help communicate to children that the clinics are for emergencies or illnesses that occur during school hours only. If your child develops an illness or has an injury at school, please be prompt when asked to pick them up. Remember if your child is sick during the night, they will most likely be sick during the day and should be kept at home. Please click HERE for an information sheet with helpful details for identifying when your child is sick and should be kept home from school. 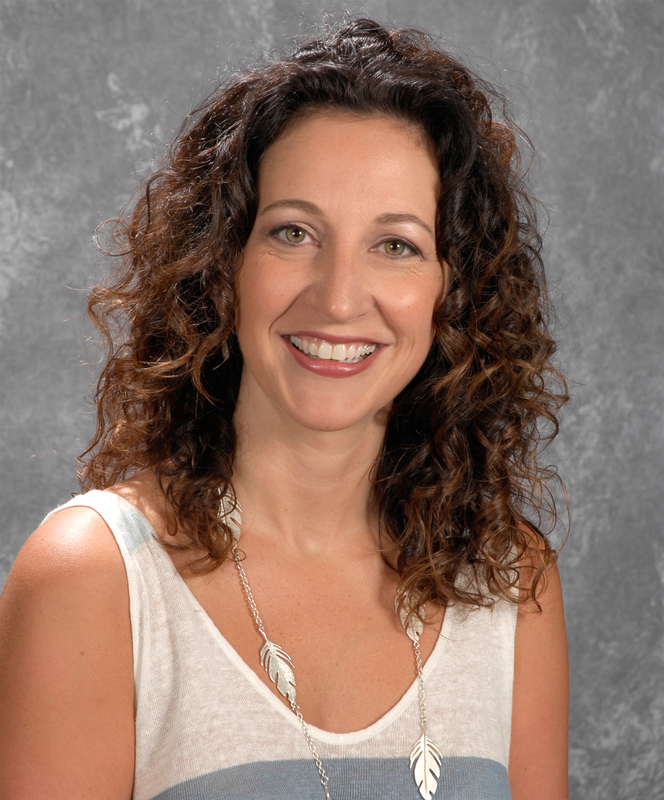 Should you have any questions about our school health clinics, please feel free to contact Olmsted Falls School District Head Nurse Carol Meszaros, RN, at (440) 427-6364. Last week was Spirit Week for Olmsted Falls Middle School students. The middle school staff and students participated in Pajama Day, Neon Day, Black Out Day, Twin Day and Color Wars. Pictured here are eighth graders getting into the OFMS spirit. The OFHS Masquers will present Arsenic and Old Lace November 15th and 16th in the school’s auditorium. Both performances for the comedy are at 7:30 p.m. 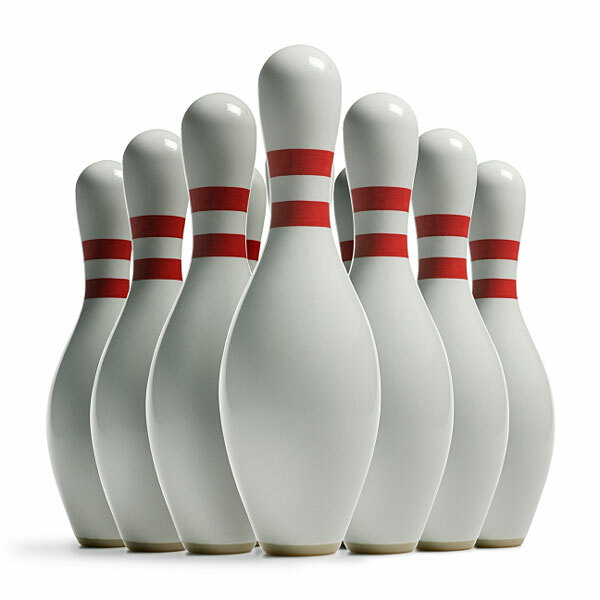 The OFHS Bowling Team’s official practice season starts November 5th at Buckeye Lanes, 3:30 – 5:15 p.m. The team is currently running voluntary open practices on Tuesdays at Buckeye Lanes 3:30 – 5:15 p.m. Any questions please contact, coach Chuck Carver at 440-590-2469. The Olmsted Falls Music Association will have its annual Wing Night Fundraiser Saturday, November 2nd from 7-10 p.m. at Tony K’s Bar and Grille, 841 W. Bagley Road, Berea. Tickets are $20 at the door. Admission includes a wings/pizza/salad buffet and beverages. At this year’s Wing Night fund raiser, OFMA will conduct a new event–a music trivia contest. Entry fee for music trivia is $10 per person and participants are encouraged to form teams of up to six players to increase their chance of winning. Come test your musical knowledge and join OFMA for a very fun evening of great food and music trivia! 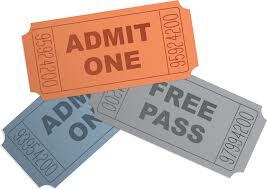 Advance door tickets will be available at this Friday’s football game next to the donut sales tent. On November 11th Falls-Lenox students and staff will be celebrating veterans and active military men and women in a special morning program, which will include a wonderful breakfast for those who have sacrificed so much for our great country. The Veterans Day Committee is asking students to make a small sacrifice, giving up a pack of gum or a candy bar, and instead bringing in that change to school. The money collected will help defray the cost of the breakfast that is planned. What a great opportunity to help the students make the connection of what it means to sacrifice, as these brave men and women have done. 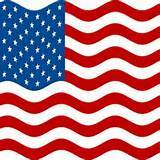 A letter will be sent home this week to inform the families of Falls-Lenox what is being planned in honor of Veterans Day. 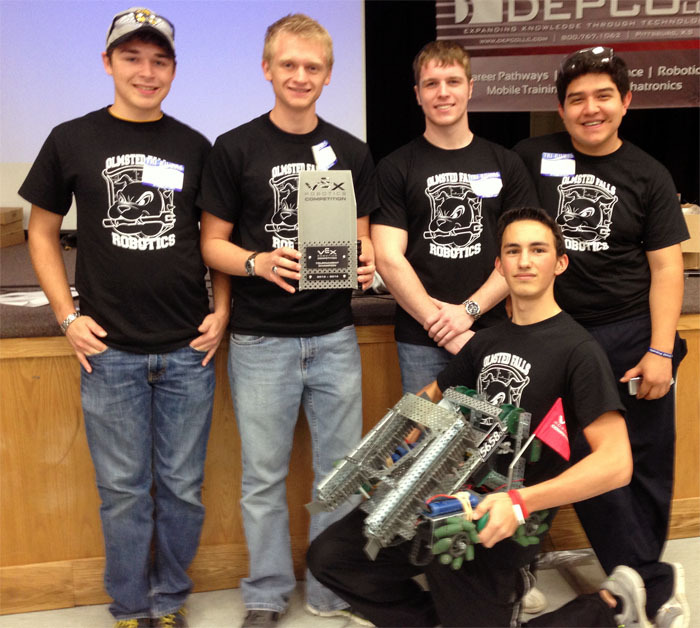 The OFHS Robotics Team of Matt Bender, Jake Olszewsk, Thomas Cobb, Moises Garcia Ponce and Garrett Yoder took first place in the VEX Robotics challenge in Marion, Ohio. The team now moves to state competition in February. For a photo gallery of the team, click HERE. To view a video of the competition, click HERE. Fifth-grade students put their scientific methodology learning to practice at their Science Fair last week. Teachers involved in the fair included Jen Atkins, Mike Schafer and Deana Harb. Students had a range of projects from which to choose that they created at home. They wrote an hypothesis, collected data and came to a conclusion. They then compared that conclusions to see if it agreed with their hypothesis. The teachers wish to thank parents for their cooperation during this learning experience. Click HERE for a photo gallery of the fair. The Olmsted Falls High School Swim & Dive Team offers the community a Mason Jar candle fundraiser through November 3rd. 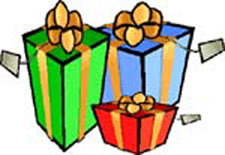 The items are great gift giving for family, friends and tEachers. They will be available before Thanksgiving. 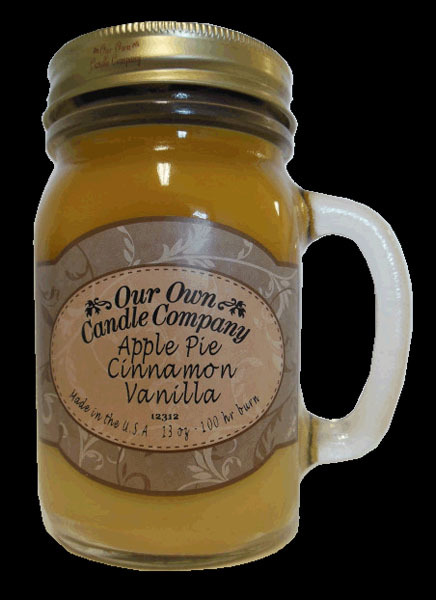 The 13-ounce jar has specifically blended soy and paraffin wax with lead-free wicks. It offers 100 hours of burn time, which is more than four days worth. They have fun holiday colors and scents. The cost is $10 for one, $18 for two and $25 for three. Find a swimmer to place your order or email Sharon Gentry at gentrys10@aol.com. TRICK-OR-TREAT!! Community trick-or-treating is scheduled for TONIGHT, Thursday, October 31st from 6-8 p.m. Please check local media outlets for any updates relating to weather conditions. An expert panel at a November 6th forum will help families recognize what they can do to keep their family safe from the emerging heroin problem in the suburbs. Judge Michael Astrab will lead the forum, which Monica Robins, WKYC senior health correspondent, will monitor. The forum is at 7 p.m. at the Westlake Porter Library, 27333 Center Ridge Road, Westlake. Click HERE for a flyer of the event. The two remaining Staff In-Service (Non-Students) days are scheduled for: Friday, January 24, 2014 and Friday, February 14,2014. Please click HERE to view the message sent out last night via email by Superintendent Dr. Jim Lloyd to all District parents regarding yesterday’s late afternoon evacuation of Olmsted Falls Middle School. Thank you again to our administrators, faculty, staff, students and parents for your calm cooperation during yesterday’s incident. Thank you also to our local safety forces for their partnership and quick response. ‘MEET THE CANDIDATES’ NIGHT — TONIGHT, OCTOBER 23rd @ 6:30 p.m. The “Meet The Candidates” Night is at 6:30 p.m. tonight. It is hosted jointly by the Olmsted Falls PTAs, Olmsted Falls Education Association (OFEA) and Ohio Association of Public School Employees (OAPSE). This event will take place in the Olmsted Falls Middle School cafetorium and all residents are invited to attend. Olmsted Falls School District Transportation Department had a special guest on its routes Tuesday morning to celebrate National School Bus Safety Week. 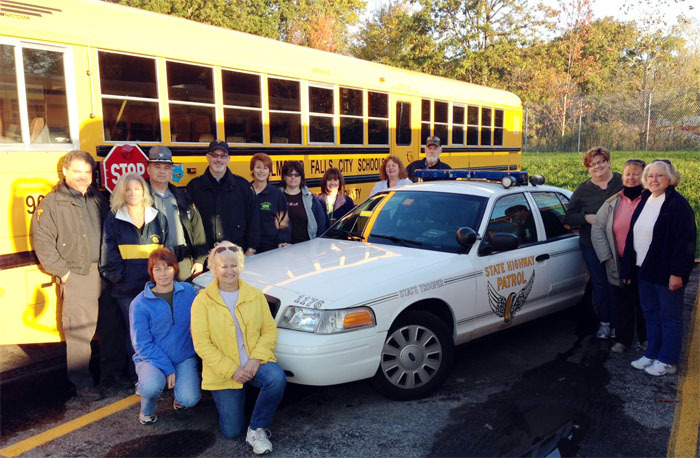 The Ohio State Highway Patrol rode along with Bulldog students and monitored traffic, bus and pupil safety. As part of this week’s observance, the city of Olmsted Falls passed a resolution recognizing National School Bus Safety Week for the district’s Transportation Department. 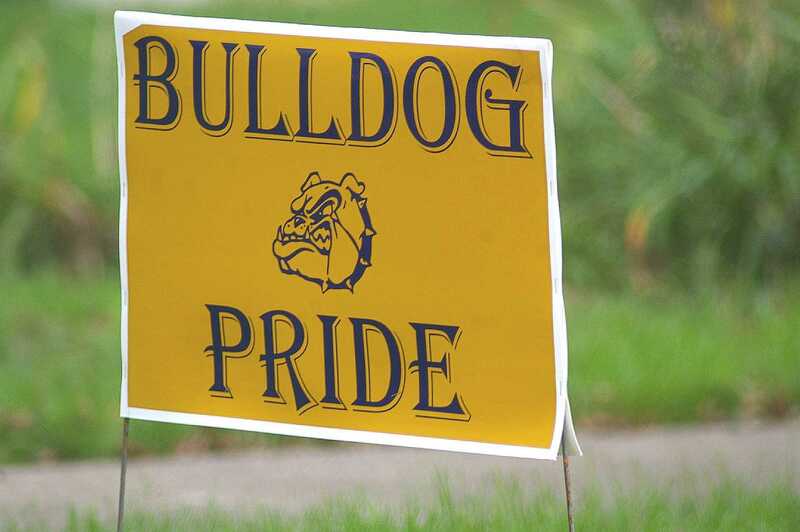 Please help support OFMS PTA by sporting around an “Olmsted Falls Middle School” T-shirt or show your Bulldog spirit by wearing a “Once a Bulldog, Always a Bulldog” T-shirt/sweatshirt. The PTA also is selling Bulldog nylon drawstring bags and Bulldog flannel pants. Orders placed will be available at the OFMS parent-teacher conference November 4th and 7th. Click HERE for order form. 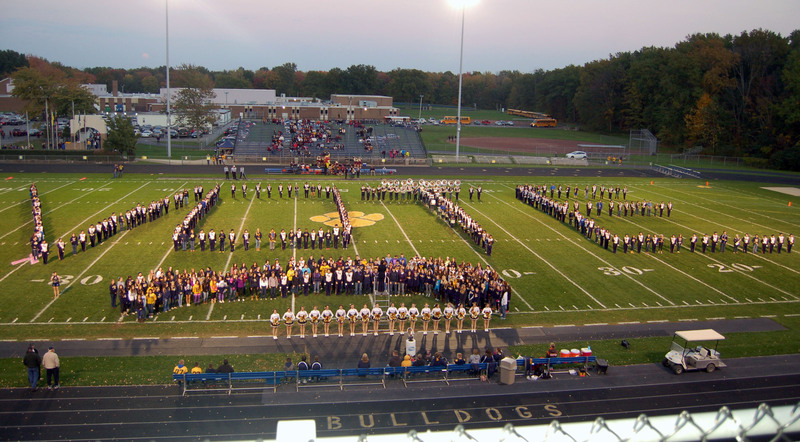 The OFHS marching band raised awareness during a special half-time performance by spelling the word “Vote” on the football field to remind the community of the importance of voting. 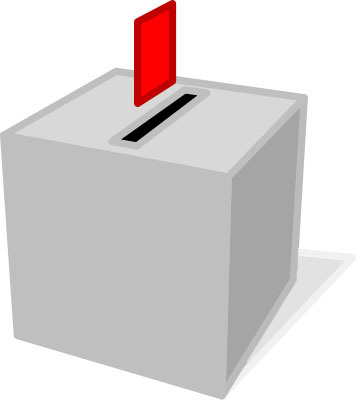 The District has a 1.8 Mill Bond Issue on the November 5, 2013 election ballot. The bond issue will pay for the construction of classrooms, renovation of common spaces, and upgrades to security systems (including security cameras) at OFHS needed to address overcrowding and improve safety/security for students and staff. Any parent or resident with questions about the Bond Issue for OFHS (Issue #86) is encouraged to contact the Board of Education office at (440) 427-6000. 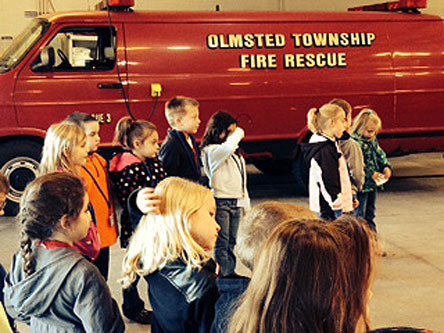 Kindergartners took a walking field trip from the ECC to the Olmsted Township Fire Station at the corner of Cook and Fitch roads. The firefighters gave them a tour of the station and showed the youngsters all the emergency vehicles. They also learned many new facts, such as firefighters have a rescue boat available to them and classroom in which they learn. A Bulldog thank you to the firefighters. Click HERE for a photo gallery of their visit. The OFMS Drama Club’s cast and crew of more than 50 students have been working hard to prepare this hip retelling of Hans Christian Anderson’s “The Ugly Ducking. The club is ‘egg-cited’ to perform the play for the community. Show time is 7:30 p.m. October 24th, 25th and 26th at the school. Tickets are $5 for adults and $3, students. 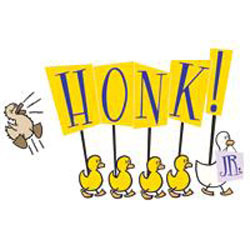 “Honk! Jr. is the story of Ugly, an awkward duck whose gawky looks instantly incite prejudice from his family and friends. Separated from the farm and pursued by a hungry cat, Ugly must find his way home. Along his rollicking and harrowing journey, he not only discovers his true beauty and glorious destiny, but also finds love and acceptance in all its forms,” wrote Music Theatre International. The OFHS Masquers will present Arsenic and Old Lace November 15th and 16th in the school’s auditorium. Both performances for the comedy are at 7 p.m. Tickets cost $5 for adults and $3, students and senior citizens. They are available at the door of the performances or by calling 440-427-6070. Are you interested in scouting, but missed the fall recruitment? 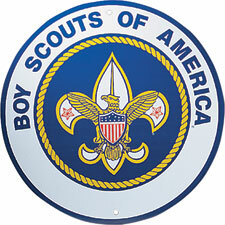 Boy Scouts will offer another opportunity from 6:30-8 p.m. Thursday, October 25th for those in grades 1st-12th to sign up for scouting. The event will take place at Falls-Lenox Primary School in the East Gym. Come and meet the groups that include the Pack, from grades 1st-5th, the Troop, grades 6th-12th and Venturing Crew, those ages 14 and older. Learn more about this great organization – and sign up! The community may dispose of unused and unwanted prescription medication from 10 a.m. to 2 p.m. Saturday, October 26th at the Olmsted Falls Police Station. Operation: Medicine Cabinet is in cooperation with the Drug Enforcement Administration and other agencies. It is a confidential program, which removes the medication safely from the home to prevent others using them and possibly overdosing. For the last six years, accidental drug overdose has been the leading cause of injury death in Ohio. Also, flushing such mediation in the sewer system may be discharged into the waterway and create undesirable environmental issues. 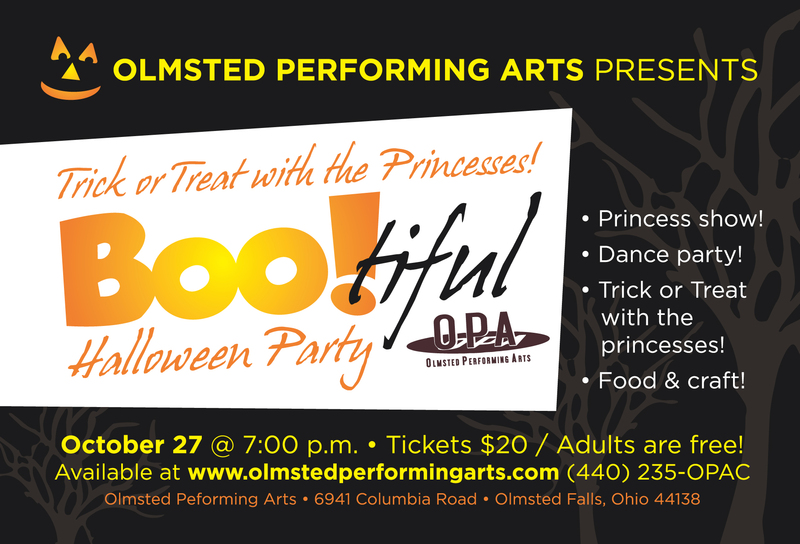 Families and the community are invited to Olmsted Performing Arts’ Boo!-tiful Halloween Party at 7 p.m. October 27 at OPA’s center, 6941 Columbia Road. It includes a princess show, dance party, trick or treat time with princesses as well as food and crafts. Tickets are $20, with adults, free. For more information, click HERE to view its flyer. There is NO SCHOOL TOMORROW, Friday, October 18th. The Olmsted Falls School District, along with surrounding districts and districts throughout the State, will be closed tomorrow for the annual NEOEA Day. Thank you to the Olmsted Falls High School administration, faculty, staff and students, as well as our local safety forces, for the orderly evacuation and detailed operations that occurred as the High School’s Safety & Security Plan was put into action on Wednesday. We want to further thank our High School parents for responding to our call to pick up their students from the designated evacuation location. Evacuation and pick-up efforts were further augmented by staff members at our intermediate and middle schools. Support was also provided by our transportation department, central office staff and countless others. The safety of our students and staff is of the utmost importance to us, and we appreciate everyone’s efforts in assisting us with Wednesday’s precautionary evacuation and school closure. Olmsted Township Police are continuing their investigation into this incident. We will provide any further updates as they become available. Thank you again to everyone. The OFHS students in the Pre-engineering class have a new piece of technology to use this year, thanks to Polaris Career Center that purchased a new Makerbot 3D printer for their use. The new printer allows students to make prototypes of ABS plastic from parts they design using the AutoDesk Inventor solid modeling software. 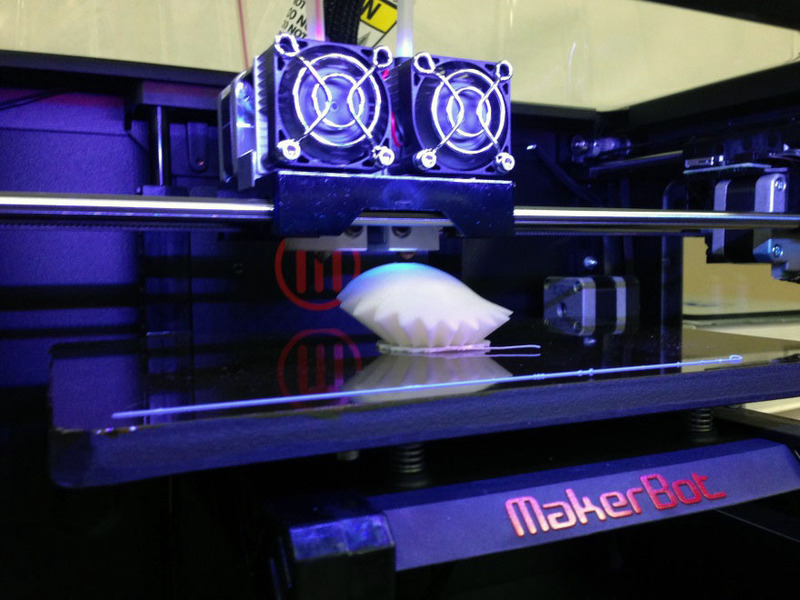 For information on Makerbot and 3D printing, click HERE. For a photo of the printer and some of the students, click HERE. Each year, all Spanish III students participate in the Collaborative Articulation and Assessment Project, C.A.A.P., which The Ohio State University sponsors. Students take a written, listening and reading assessment, which gives students an indication of their potential university course placement. It also provides feedback to high school students and teachers about general performance levels in comparison to other districts in the state. The 2012-2013 Third Year Spanish Students performed exceptionally well on the tests last year, scoring well above the high school averages in all three assessments. OFHS Spanish Teacher Jenelle Hughes provided the results. The high school average for writing was 4.9 while OFHS was 6.3; listening: high school average, 7.2, OF, 8.6 and reading: high school average, 5.9 and OF, 7.3. Muy bien, students. OFMS DRAMA CLUB PRESENTS THE PLAY HONK! JR. The OFMS Drama Club’s cast and crew of more than 50 students have been working hard to prepare this hip retelling of Hans Christian Anderson’s “The Ugly Ducking. The club is ‘egg-cited’ to perform the play for the community. Show time is 7 p.m. October 24th, 25th and 26th at the school. Tickets are $5 for adults and $3, students. 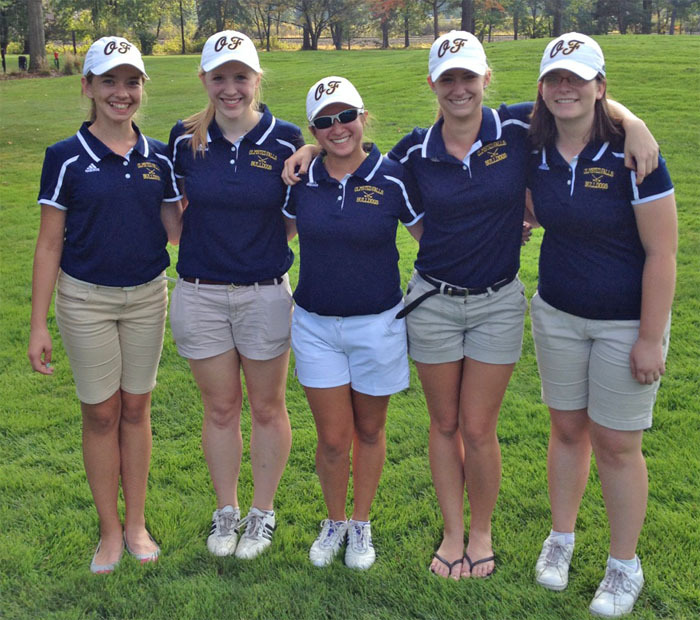 Coach Steve Hunter and the OFHS girls golf team saw some great accomplishments this season. The team finished in third place in the SWC this season with an 8-4 record. Pictured in this photo are, from left, Abbey Boenig-Dombek, grade 9; Emily Gerycz, 10th; Ashley Gomez, 12th, Jessica Bobik, 12th and Gabby Zemaitis, grade 9. Senior Ashley Gomez earned a trip to the Division 1 District Tournament competition by placing fourth in sectional play. She defeated a golfer from Normandy High School in a sudden death play-off hole to quality for that honor. She finished 15th among the 76 individual players competing at District with a score of 84 for 18 holes. Ashley also placed second overall at the SWC Tournament with a score of 81. She earned 1st Team All-SWC honors for the second straight year. Click HERE to see Ashley holding her ticket to the Division 1 District Tournament. Student-athletes in grades 8, 9 and 10, who are interested in competing on the girls varsity golf team next fall for 2013, should contact Coach Hunter at shunter@ofcs.net. 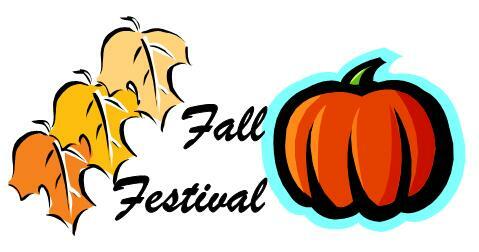 The OFCS Helping Hands group invites families from 3-5 p.m. October 19th to the Red Wagon Farm Pumpkin Festival, 16801 E. River Road (Route 252), Columbia Station. The event’s admission and parking are free. Enjoy a hay maze and straw jumping area for kids 12 and under. A 5-acre corn maze challenge is available at a charge of $3 for adults and $2 for kids ages 3-12. Wagon rides are $2 a person. Carry as many pumpkins as you can all for $12 a lift. There also will be a food tent, fresh produce and fall decorations available. Please reserve by contacting Mariel Krakowiak, mkrakowiak@ofcs.net by 10 p.m. Friday, October 18th if you plan to attend. Also include the ages of the children attending with your group. Look for the gold Helping Hands poster to find the group at the fest. Helping Hands is a disability awareness program that helps people of all ages learn attitudes of acceptance, dignity and respect toward all people, especially those with disabilities. If your child needs medication during school hours, they must submit the proper paperwork. Medication forms are available online by clicking HERE. Our school nurse reminds parents administering any non-prescription or over- the-counter medication requires only a parent signature and the completion of Form A. 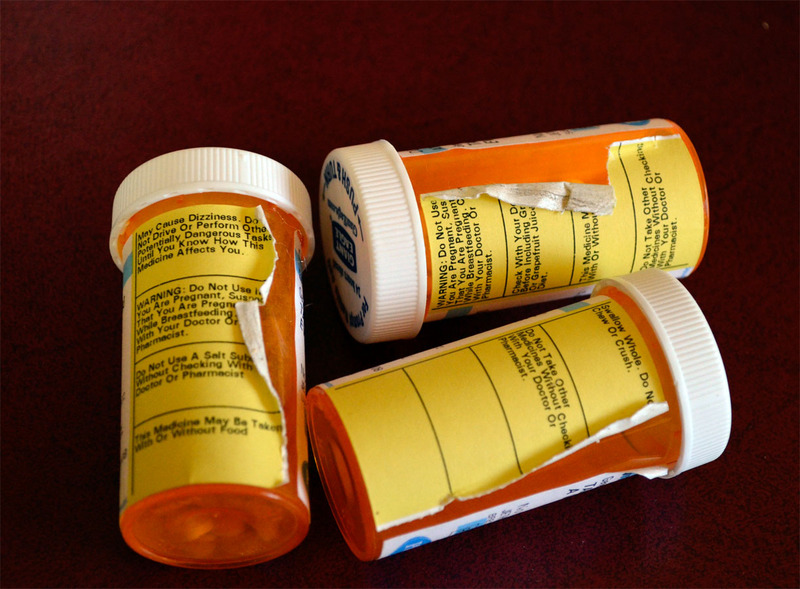 All non-prescription medications will be given per package instructions, otherwise a physician’s signature will be needed. Please send medication in its original container. The administration of any prescription medication requires parent and physician signatures and completion of Form B. All medications must be delivered by a parent or responsible adult in the container that the pharmacy provided. Please do not let your child bring the medications to school. Medications are valid for the current year only. Danica, a first grader in Mrs. Kolozvary’s class, entered a video featuring a recipe for Apple-Cinnamon Rice Pudding that Uncle Ben makes. Her rice and apple recipe features apples picked from her own yard. Community votes are worth 20 percent of the judging criteria. Three finalists will be flown to New York to appear on the Rachael Ray Show. Two of them also will receive $10,000 for their schools. The grand prize winner will appear on Rachael Ray again and receive $30,000 for a “cafeteria makeover,” to be used at the school’s discretion. You can vote once per day. Click HERE for the link to her video and to vote. Bay Village Firefighter Dave, the father of Dalton, visited Mrs. Doyle’s and Ms. Metzer’s AM kindergarten class during Fire Safety Week. 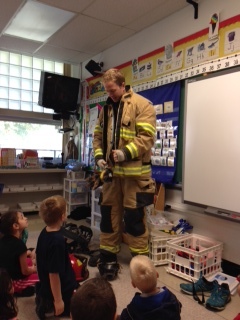 The children were fascinated to see all the gear he wears on the job and how different he sounds when he wears his mask and oxygen tank. A photo gallery is HERE. They had hands-on learning by practicing “stop, drop, and roll” and learned fire safety tips. Dalton’s classmates loved having Dalton’s dad visit them. Thank you, Firefighter Dave. The OFHS PTA membership drive is well underway. Mr. Blake’s homeroom brought in the most memberships for the month of September. 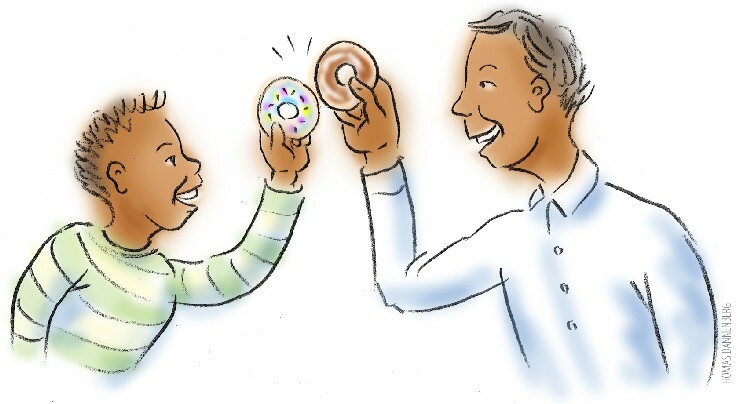 The class was treated to donuts last week as a thank you for their parents’ support. The homeroom contest will continue in October — there are several homerooms in the running so sign up today! Don’t forget that senior parents are especially encouraged to join. If you are a member, your senior is eligible for one of several scholarships the OFHS PTA awards at the end of the year. Simply fill out your membership form today and send it into the high school marked “PTA Membership”. The PTA will have tables set up during parent teacher conferences in November. Stop by and see them. Click HERE to download the Olmsted Falls High School PTA 2013-2014 membership form. Click HERE for a list of this year’s meeting dates. ECC’s kindergarteners start the year annually with the Crazy Color Creatures book, in which they read, do word play and color their own copy. For “Mel O. Yellow plays the cello” day, Gabriella’s dad brought in a cello! He taught Mrs. Doyle’s and Ms. Metzger’s AM kindergarten class quite a bit about the instrument. 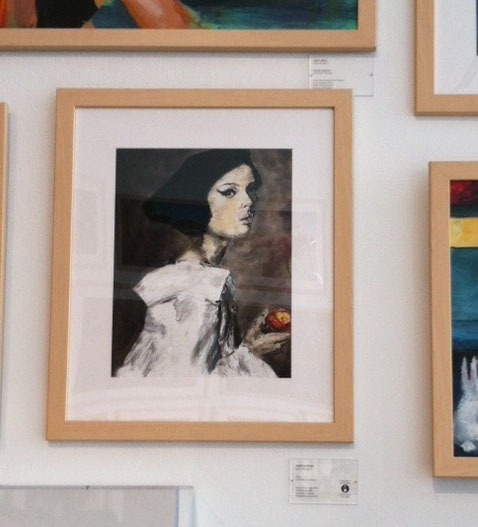 For a gallery of photos, click HERE. Gabriella’s dad, Bill, is a jazz professor at Cleveland State University and a musician. Everyone thought his cello playing was great. Thank you, Bill! The OFIS PTA invites PTA member dads, grandpas and other important men in the life of the school’s students to share some time together. These male figures are invited to attend Donuts for Dad from 7-7:30 a.m. Wednesday, October 23rd. Just bring your PTA card for admission. Not a member yet? No problem. PTA will accept your membership at the door for just $6. Please RSVP by October 21st. For more details, contact Amy Krogh, amymkrogh@hotmail.com or 440-235-0582. 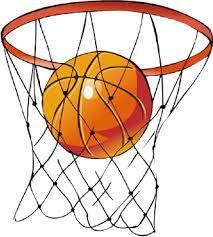 The Hoops 4 Hope/Heroes 4 Hodgkins benefit runs from 3-6 p.m. Saturday, October 19th at Olmsted Community Center. Please join the Friends of the Hathcock family in support of their fight against Hodgkin’s disease. For more information about the event, click HERE. “Meet The Candidates” Night – Wednesday, October 23rd at 6:30 p.m. – Hosted jointly by the Olmsted Falls PTAs, Olmsted Falls Education Association (OFEA) and Ohio Association of Public School Employees (OAPSE). This event will take place in the Olmsted Falls Middle School cafetorium and all residents are invited to attend. Support the newest sport for girls and boys in town. 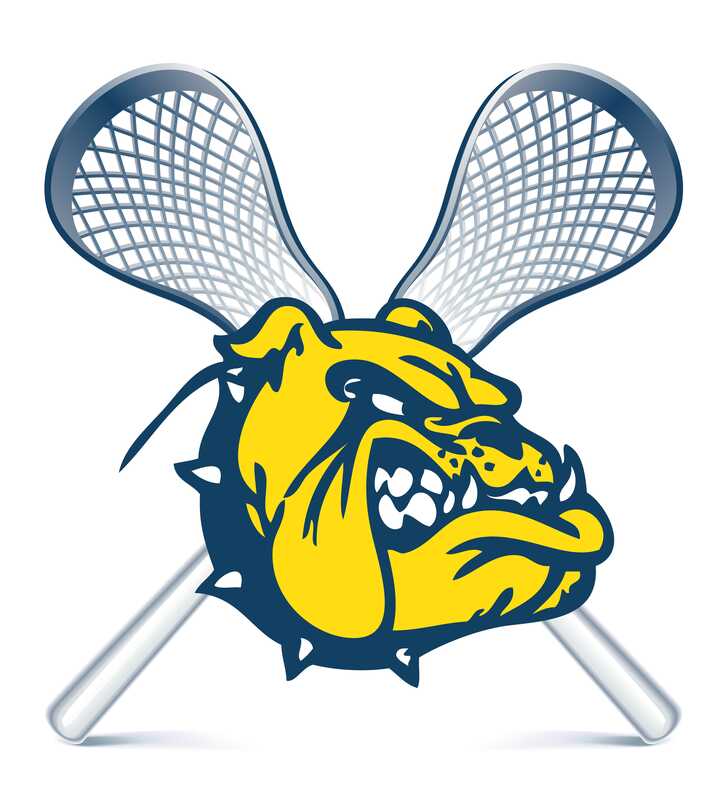 The Olmsted Falls Lacrosse Association offers a night out from 7-9 p.m. Saturday, November 16th at the Upper Deck, 375 Bagley Road, Berea. Tickets, which cost $20, include refreshments, pizza, wings and rigatoni. There will be raffle boards, 50/50 and gift baskets, too.This year’s fundraising activities will assist in further growing the program with additional high school uniforms as there will be JV and Varsity boys’ teams and more girls playing as well. The money raised also will help keep registration fees at 2013 levels. Please contact olmstedfallslacrosse@yahoo.com for ticket information or Kelly Atkins at bobcatteach@gmail.com with donations of gift basket items or funds toward the big ticket item. Parents and residents are invited and encouraged to attend the next Issue 86 information session to learn more about the 1.8 Mill Bond Issue on the November 5th election ballot. WHEN: **TONIGHT** Wednesday, October 9th @ 7 p.m.
WHY: To be fully informed about the scope of and need for this bond issue. Whether you have a student now at the ECC, at Falls-Lenox, at OFIS, at OFMS, at OFHS, or a little one not yet school age, our current high school building will be the high school they will attend. There are no plans in the near or distant future to construct a new high school facility in our district. Please join Superintendent Dr. Jim Lloyd and OFCS parents for this important presentation – and bring a friend, family member and/or neighbor along with you! Issue 86 is critical for Olmsted Falls Schools, our community, our children and our future prosperity. The safety and security of the students and staff is top priority of the district. Issue 86 shares the desire of the community and the school district to constantly look for ways to improve and maintain school safety. State funding has been reduced by millions, so it is up to our local community to protect our school. Issue 86 will address the safety, security and overcrowding issues present at Olmsted Falls High School. Olmsted Falls School District wishes to express sincere appreciation to Olmsted Falls PTA Council for this important showing of support! 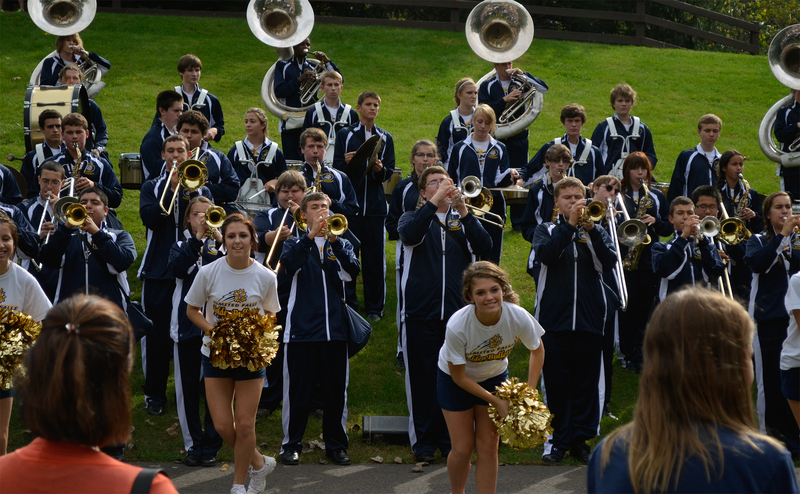 The OFHS marching band wowed the crowd that gathered at Sunday’s Falls Day in the Park at East River Park. Band members played several selections and even strutted a bit of their showmanship with a few dance routines. The cheerleaders also performed and added to the fun. There is a photo gallery available by clicking here. Holly Taylor, captain of the OFHS tennis team, among other accolades, recently was featured on News Channel 5 as its Student Athlete of the Week. She and coach Laura Graham were interviewed in the segment, which may be seen by clicking HERE. 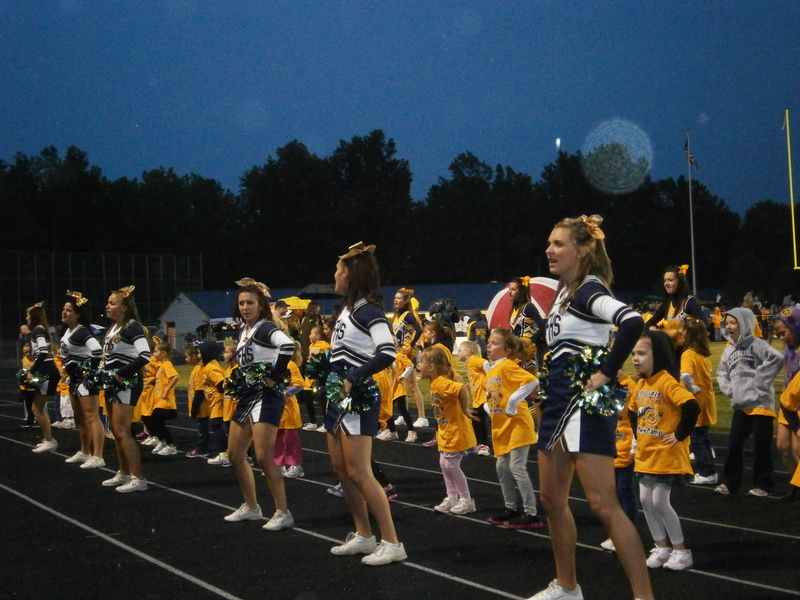 This cheering event is for the 3rd through 5th graders who attended the Mini Cheer Night on Friday, September 20th. They are invited to cheer at the OFHS varsity football game against Avon Lake High School at 7 p.m. October 18. They will cheer during the first half of the game. All Mini Cheerleaders will be admitted into the game free. For time arrival and other pertinent information, click here to view the flyer for the event. The 2013 Puppy League for all girls in 4th, 5th and 6th grades begins on Saturday, October 26th. Registration forms are currently being accepted. The format of the league will be the same as last year; there will be a 15 minute shoot around time, 45 minutes of skill work each day within each player’s team and then the players will play either 3-on-3 games, 5-on-5 games, competitive contests, or a mixture of all three the last hour. Players from the Varsity and JV teams will coach each team while the coaches of the program will be there to monitor, supervise, and officiate all the games. All sessions will be held at Olmsted Falls High School (HS), but times will vary from week to week. All participants will also be invited to attend a Varsity Girls Basketball game. For additional information – including complete list of league dates and registration form – please click HERE. Registration for the 2013 Boys Development Basketball League is now open to those in grades 4-6. Players will participate in skill sessions and play team games on Saturday mornings and one Wednesday morning during November and December. OFHS varsity basketball coaches and players will instruct the league, which emphasizes basic skills, game rules and teamwork in an atmosphere designed to be educational and enjoyable. The cost is $50, which includes instruction, admission to a varsity basketball game for the participant and a T-shirt at the end of the league. Registration and fees will be accepted up to and including Saturday, November 2nd. To access the registration form and more details, click here. OFHS senior girls will compete against the junior girls in the annual Powder Puff football game at 7 p.m. Nov. 5. at the high school football stadium. Tickets are $5 or $4 presale at the school for students only. The gates open at 6 p.m.
Don’t miss the fun and festivities, including half-time games, raffles and concessions. All proceeds benefit OFHS Post Prom Committee. Hope to see the community support this fun and beneficial event. The much awaited 2013-2014 Activities Calendars have arrived! Calendars were sorted and distributed to each building. Students should have brought the calendars home in their backpacks already. The calendar’s October page is available online by clicking HERE. In an effort to raise awareness throughout the community about Issue 86, the District’s 1.8 Mill Bond Issue to address overcrowding and improve safety and security at OFHS, the Pride In Olmsted Schools Committee is seeking residents living on heavily traveled roads (i.e. Bagley, Columbia, Cook, Fitch, Stearns & Usher) and/or main arteries into and out of neighborhood developments / sub-divisions, who would be willing to have an Issue 86 yard sign placed on their property. If you are willing to have a sign placed in your yard, please e-mail prideinolmstedschools@gmail.com with the subject line “Yard Sign” and provide your street address and closest major intersection. Distribution of yard signs will begin later this week. 8TH GRADE WASHINGTON DC PARENT MEETING RESCHEDULED! 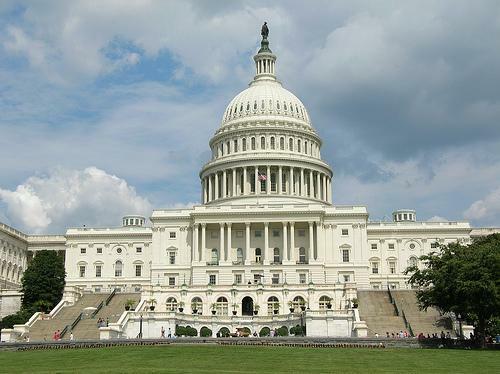 The 8th grade Washington DC Parent meeting, which was originally scheduled for Wednesday, October 9, at 7:00 PM, has been rescheduled for Thursday, Oct. 10, at 7:00 PM, in the OFMS Cafetorium. Click here to view the informational flyer. Preschool Open House sponsored by the OECPTA will be held Thursday, October 10th from 6:30-7:30pm at the ECC and is open to everyone. Come gather information from a number of local preschools all in one place. This is a free event. OECPTA General Meeting will be Thursday, October 10th at 7:30pm at the ECC. If you would like to learn more about the Olmsted Early Childhood PTA, come to the meeting or check us out at www.oecpta.org. Any questions, please email Beth Mordarski, OECPTA President at bethmordarski@gmail.com. The OFHS Post Prom will have its monthly meeting at 7 p.m. Tuesday, October 15th in the high school library. The meeting will concentrate on creating a theme. Parents and community members are invited to share ideas. The Olmsted Falls Masquers and Forensics Patrons (OFMFP) is the non-profit parent booster group charted to support performing arts, speech, and debate in Olmsted Falls High School, and they need your support! Please click HERE to download more information on membership and volunteer opportunities this year. Post Prom is proud to present a brand new way to show your bulldog spirit! 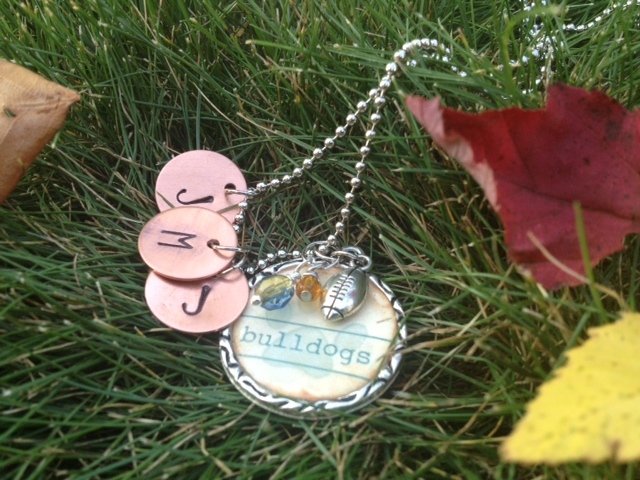 Completely customizable and personalized necklaces! Proceeds benefit Post Prom. Please click HERE to download the order form. Email questions to laurieshand@hotmail.com. OLMSTED FALLS ALUMNI ASSOCIATION ANNUAL ATHLETIC HALL OF FAME DINNER – OCTOBER 17TH! Introducing This Year’s Inductees! On October 17th, the Olmsted Falls Alumni Association will induct seven outstanding athletes and one coach into the Olmsted Falls High School Athletic Hall of Fame. This year’s inductees include: Fred Loepp, ’54, Luke Workman, ’94, Trevor Urban, ’95, Carissa Mahoney, ’96, Jackie Mason, ’00, Kenneth Jones, ’01, Timothy Curran, ’03, and Coach John Winters. Please click HERE for photos of the inductees. The Induction Ceremony and Dinner will take place at the German American Club, 7370 Columbia Road, Olmsted Falls, on Thursday, October 17, starting at 5:30 p.m. Tickets are $25 and all are welcome to attend. The inductees will be introduced at the October 18th home football game right after the FIRST quarter. 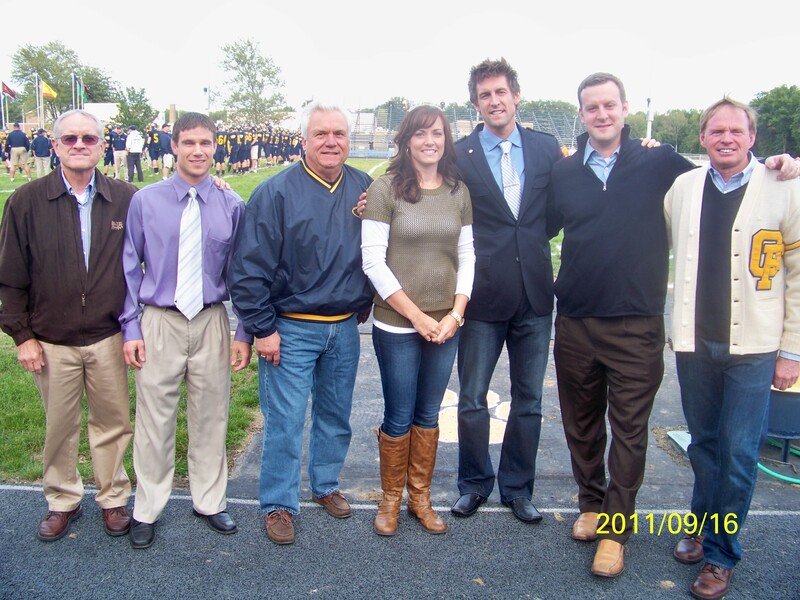 Pictured at left are the past 2011 Athletic Hall of Fame Inductees being introduced at a home football game; they are L-R: Coach Jim Emigh, Kyle Stoffer ’01, Ron Molosky ’61, Abby Jaroscak Latra ’98, Mike Gansey ’01, John Storey ’97, George Fischer ’71. Reservation forms for the Thursday night ceremony are available by clicking HERE or contacting Jenny McKeigue, OFHS Alumni Director, at 440-427-6030 or ofhsalumni@yahoo.com. Get in the game this fall! Students in grades K-8 can play the 2013 Touchdown for Reading online reading game, presented in partnership with the Cleveland Browns and Cleveland Clinic. Visit cuyahogalibrary.org/touchdownforreading.aspx for details. September 3rd through November 22nd! 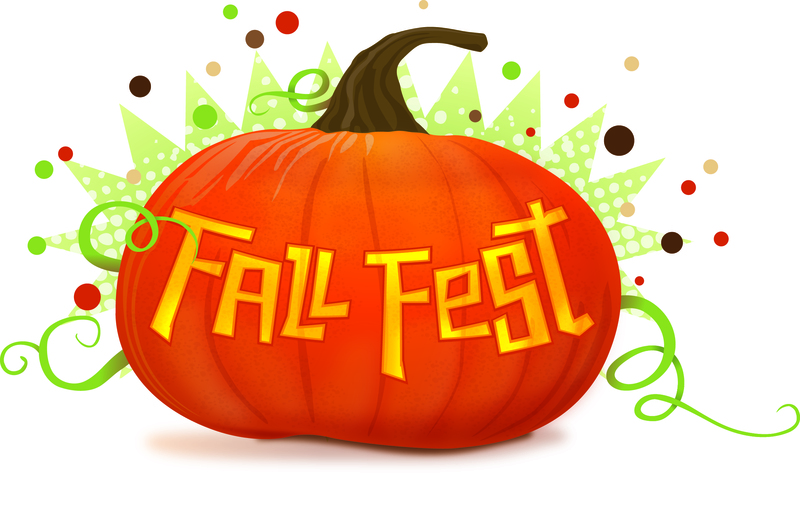 For a complete listing of the Library’s fall events, please click HERE. 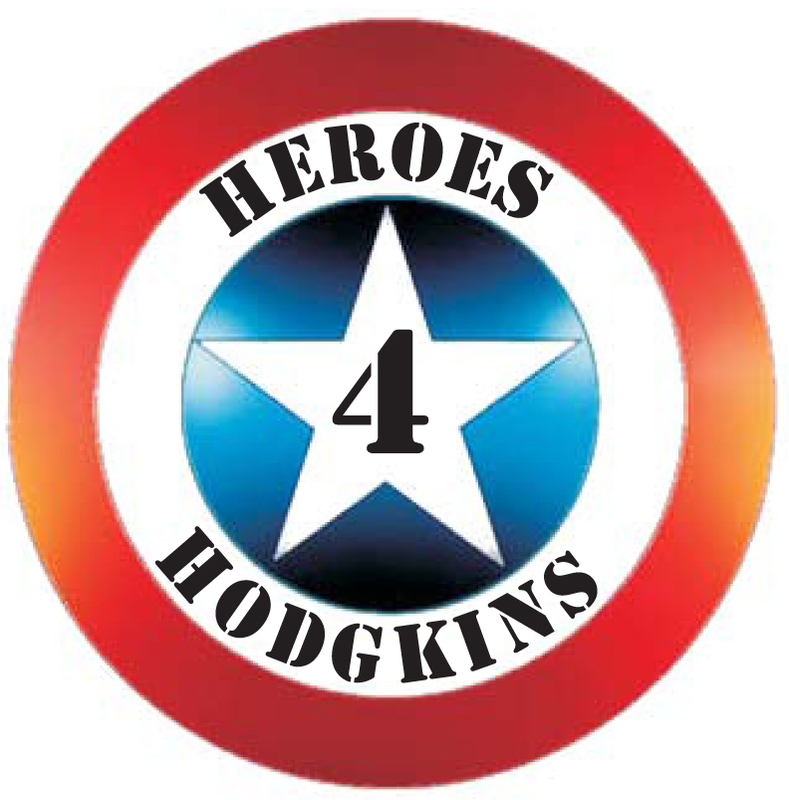 The Hoops 4 Hope/Heroes 4 Hodgkins benefit runs from 3-6 p.m. October 19th at Olmsted Community Center. Please join the Friends of the Hathcock family in support of their fight against Hodgkin’s disease. For more information about the event, click HERE. WHEN: Wednesday, October 9th @ 7 p.m.
OFHS junior Teresa Wang, recent Gold Key winner in the National Scholastic Art & Writing Contest, was profiled by the Sun News last week. Please click HERE to read the article about Teresa. Congratulations and kudos again to this talented Bulldog! 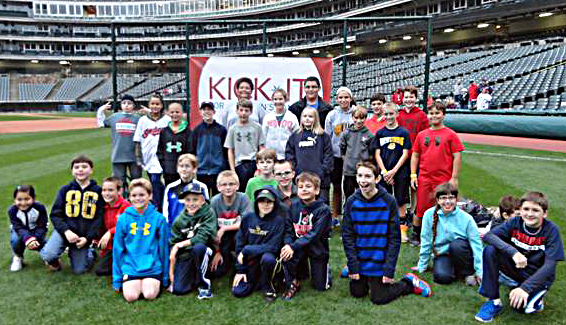 A rescheduled day at the Cleveland Indians’ Progressive Field only added to the excitement for the top fundraising classes of Kick-It, which funds childhood cancer research. 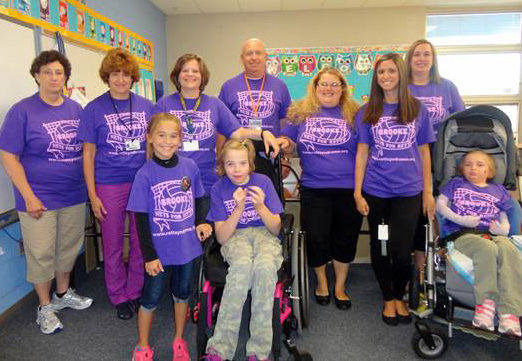 The students at Olmsted Falls Intermediate raised close to $16,000 over a two-week period for the fundraiser. A Chagrin Falls boy, 10, founded Kick-It in 2009. He decided to turn his favorite game — kickball — into a fundraiser. Games have been played across the country and raised about $1.5 million. OFIS’s top fundraising classes were Mr. Englehart, Mrs. Harb, Mrs. Venecek, Mrs. Atkins and Mr. Judson. They played kickball with other fundraising schools. To view a photo gallery of the event, click here. A thank you to all who helped raise awareness and research dollars for this cause. 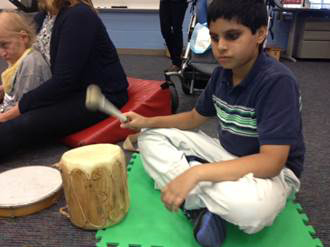 Music therapy sessions recently came to Mrs. Doick’s class at ECC, Ms. Schoenhofer’s at Fall-Lenox and Ms. Giambio’s at OFIS. 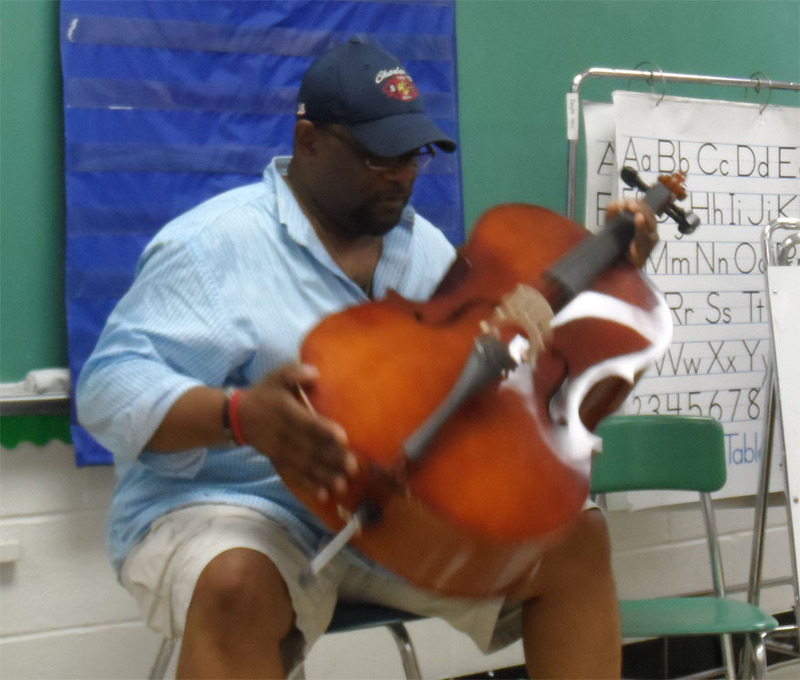 Music on A Mission offers the program, which donates its time to provide monthly music therapy sessions to the district’s preschool through grade 5 Moderate-Intensive classrooms. These sessions provide exposure to therapeutic music experiences by experienced music therapists. The students had the opportunity to explore and play instruments, dance, sing and engage in social interaction through music. Music On A Mission is an organization dedicated to providing music enrichment to the community. The organization’s efforts are funded by various activities, including concerts by Just Us band whose lead singer is ECC director Melinda Brunner! Thank you, Melinda, Music On a Mission and Tina Moreno, the latter who coordinated these efforts. To view a photo gallery, click here. Each year the Olmsted Falls volleyball program completes a community service project. It has promoted the Volley for a Cure in the past with the Ohio High School Volleyball Coaches Association. This year, those in the program changed their effort to do something special and unique for a community member. They chose “Nets for Retts” because the VanArnhem family is so special to them. Brooke is a student and Jeff, a teacher. Team members planned the entire event. They sold 200 cookie jars at Shaker’s MarketPlace, had a pasta and pizza night at Aces Grille with coaches working the event and sold 50/50 raffle tickets at the game. They also sold T-shirts during their lunches. The end result – the program raised $4,944.87 for the International Retts Syndrome Foundation. Great job Bulldogs! 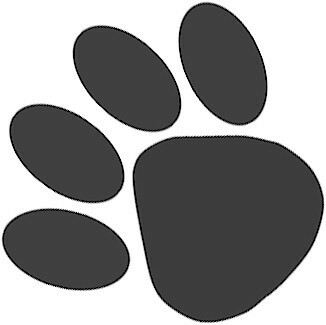 The 2013 Puppy League for all girls in 4th, 5th and 6th grades begin on Saturday, October 26th. Registration forms are currently being accepted. 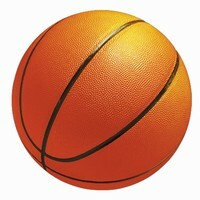 The format of the league will be the same as last year; there will be a 15 minute shoot around time, 45 minutes of skill work each day within each player’s team and then the players will play either 3-on-3 games, 5-on-5 games, competitive contests, or a mixture of all three the last hour. Players from the Varsity and JV teams will coach each team while the coaches of the program will be there to monitor, supervise, and officiate all the games. All sessions will be held at Olmsted Falls High School (HS), but times will vary from week to week. All participants will also be invited to attend a Varsity Girls Basketball game. Mrs. Susan Chaplin is a seventh-grade mathematics teacher at OFMS. She also serves the district as a teacher mentor, technology committee member, Power School staff trainer, OFEA building rep and homework lab advisor. Mrs. Chaplin said she loves being a Bulldog because she believes we all care so much about each other and the success of our children. She enjoys seeing the Bulldog spirit instilled in her son, Cole, who is a Falls-Lenox first grader. Her favorite part of being a teacher is the ability to make math understandable to all her students and seeing that “I’ve got it!” moment in a student’s face. In her spare time, Mrs. Chaplin enjoys participating in anything outdoors, walking her dog, Lola, traveling and spending time with her son. 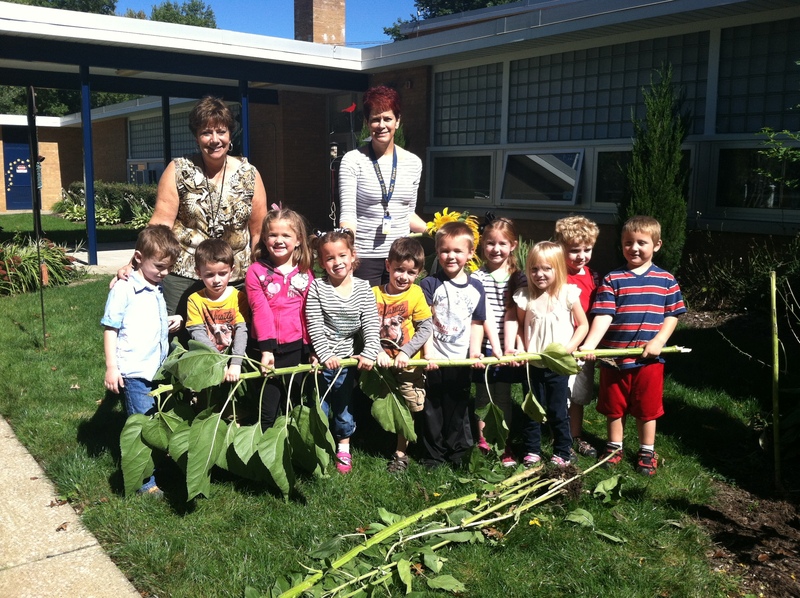 Mrs. Atkinson’s PM class harvested sunflower seeds from the tall plants that her class planted in the Spring. A sunflower head consists of flowers that mature into seeds, which could number into the hundreds. Leaves of the sunflower can be used as cattle feed, while the stems contain a fiber which may be used in paper production. What a cool science project. 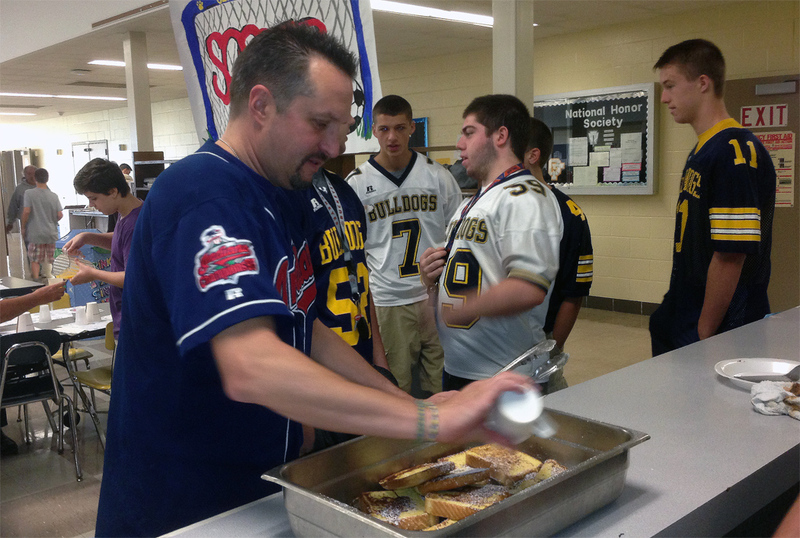 On Sunday the Olmsted Falls Kiwanis Club hosted its annual free Community Pancake Breakfast at the OFHS cafeteria. It is a major fundraiser for the group, which accepts donations at the event. Superintendent Jim Lloyd spent time at the breakfast adding just a bit more flavor to the French toast. Almost 200 Bulldog alumni from the graduating classes of 1938 to 1969 attended the annual Golden Grads Reunion luncheon Sept. 26. Many traveled from out-of-town locations to attend and stayed through the weekend to participate in a variety of reunion and Homecoming festivities. 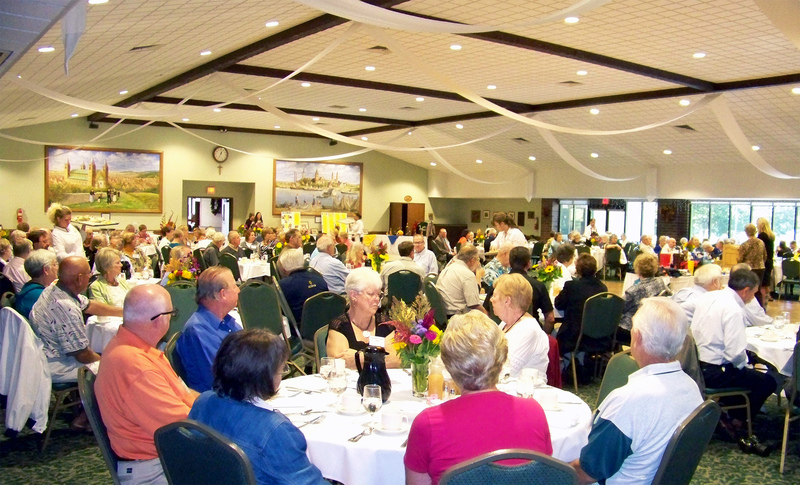 The classes of ’53 celebrated its 60th reunion and ’63 kicked off its 50th reunion activities with this event. Jean Lewis Rendfleish, class of 1938, won this year’s coveted “Oldest Alumni” award. OFHS memorabilia was displayed during the luncheon. Items included trophies dating from 1922-1962; yearbooks from 1926-1973; four donated Olmsted Falls jackets from the years 1939, 1957, 1960 and 1966 and two class keys. For more pictures of this event, you can click here or visit and friend us on Facebook at “Olmsted Falls.” If you would like to donate any historical Olmsted Falls High School items for future Golden Grads reunions and our future Alumni display case at the high school, please contact Jenny McKeigue, 440-427-6030 or email ofhsalumni@yahoo.com. The much awaited 2013-2014 Activities Calendars have arrived! Calendars were sorted and distributed to each building on Friday. Students in grades Pre-K to 5, who are the youngest student in their household, brought calendars home in backpacks on Friday. 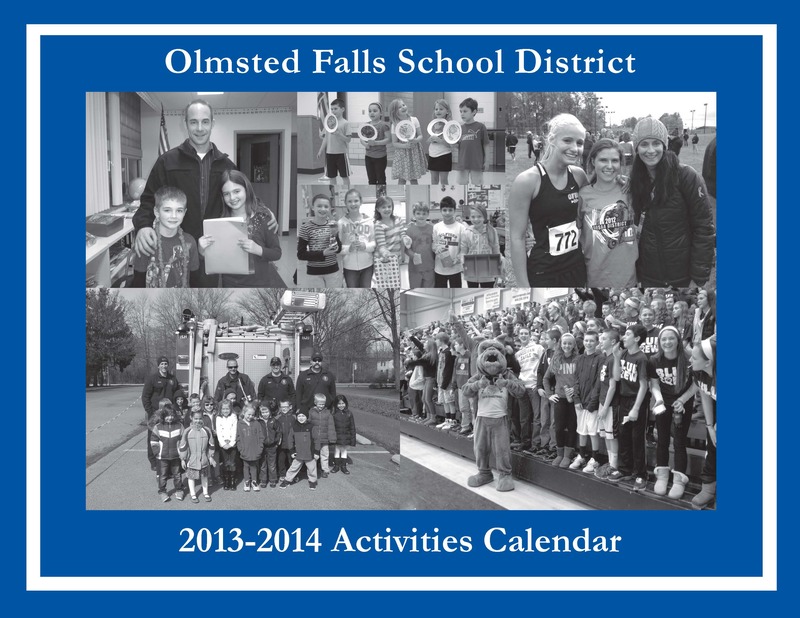 Calendars will be distributed in homerooms at OFMS and OFHS on Monday. In the meantime, parents can click HERE to download the September / October calendar pages. In an effort to raise awareness throughout the community about Issue 86, the District’s 1.8 Mill Bond Issue to address overcrowding and improve safety and security at OFHS, the Pride In Olmsted Schools Committee is seeking residents living on heavily traveled roads (i.e. Bagley, Columbia, Cook, Fitch, Stearns & Usher) and/or main arteries into and out of neighborhood developments / sub-divisions, who would be willing to have an Issue 86 yard sign placed on their property. If you are willing to have a sign placed in your yard, please e-mail prideinolmstedschools@gmail.com with the subject line “Yard Sign” and provide your street address and closest major intersection. Distribution of yard signs will begin next week. The 2013-2014 OFHS Swim and Dive Team will have an informational meeting for parents and students for its upcoming season. The meeting is at 7 p.m. Tuesday, Oct. 8 in the high school choir room. If you are unable to attend the meeting or have any questions, please contact Coach Matt Laughlin at mlaughli@ymail.com. The OFHS Post Prom will have its monthly meeting at 7 p.m. Tuesday, Oct. 15th in the high school library. The meeting will concentrate on creating a theme. Parents and community members are invited to share ideas. NATIONAL COOKING CONTEST PROMOTES HEALTHY EATING…AND PROVIDES CHANCE TO WIN SCHOOL CAFETERIA MAKE-OVER! Bulldog families are invited to enter the “Ben’s Beginners Cooking Contest” sponsored by Uncle Ben’s. Simply make a short video of your and your child cooking a rice dish and upload it to www.UncleBens.com. Click HERE for additional information and complete rules. Top prizes include: $15,000 grand prize; appearance on The Rachael Ray Show; $30,000 School Cafeteria Makeover. Entries must be submitted by 11:59:59 p.m. EDT on October 6, 2013. FALLS DAY IN THE PARK – SUNDAY, OCTOBER 6TH at East River Park — It’s the annual Falls Day in the Park from 1-4 p.m. at East River Park off of Lewis Road. This community day of fun includes a performance by the OFHS marching band,; Music Connections DJ; crafters and other vendors; activities and crafts for kids; jugglers; face painting and refreshments. The Citizen of the Year will be announced. The Olmsted Falls Parks & Recreation Board sponsors this free event. Families and the community are invited to Olmsted Performing Arts’ Boo!-tiful Halloween Party at 7 p.m. October 27 at OPA’s center, 6941 Columbia Road. It includes a princess show, dance party, trick or treat time with princesses as well as food and crafts. Tickets are $20, with adults, free. For more information, go to www.olmstedperformingarts.com or call 440-235-OPAC. The center also has its 2014 theatre preview available online. Click here to see flyers for the Halloween Party and its theatre preview.